Frozen puff pastry streamlines the making of these fanciful fruit tarts. A typical package holds two pastry sheets, each of which can be cut into quarters, and then the edges of each quarter are turned in to create a lovely 5-inch-square tart with a shallow rim. The recipe can be completed in stages a day ahead and baked the day of the party. The puff pastry will stay crisp at room temperature, but these tarts will hit the sweet spot if given a five-minute blast in the oven right before you serve them. There is nothing like warm glistening fruit, crunchy layers of pastry, and a scoop of ice cream melting into a pool of richness on the side. In a small bowl, beat together the eggs and water until blended and set aside. Place the cookies in a heavy lock-top plastic bag and, using a rolling pin, crush the cookies to make fine crumbs. Alternatively, crush the cookies in a food processor. Set aside. Combine the granulated sugar and cinnamon in a small bowl and set aside. Have ready 2 rimmed baking sheets, preferably nonstick. For pans without a nonstick finish, line the pans with parchment paper or nonstick baking liners. Position 1 rack in the center and another rack in the lower third of the oven. Preheat the oven to 400 degrees. Place the apricot preserves in a small bowl and microwave just until melted, about 10 seconds. Alternatively, heat in a small saucepan over low heat until melted. Set aside. Prepare the pears. Remove the pastry from the refrigerator. Using a pastry brush, brush the pastry with the beaten egg mixture. Place a rounded tablespoonful of the cookie crumbs in the center of each pastry shell and use your finger to spread it around evenly, keeping the crumbs off the edges. Lay the pear slices in a tight overlapping pattern over the cookie crumbs. Sprinkle the pears with the cinnamon-sugar mixture. Lightly brush the pears with the melted preserves. 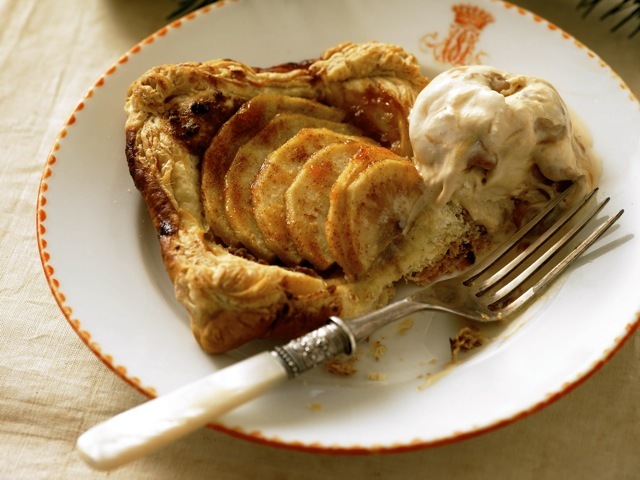 Using a small fine-mesh sieve, dust the top of each tart with the confectioners’ sugar. Serve warm on individual plates with a scoop of ice cream on the side.